Summary : A good, but not great, lemon flavored organic chamomile tea. The lemon and chamomile flowers mix to produce a unique, but not special, taste. Review : I love chamomile teas, even if they don't taste that good. The reason of course is because chamomile teas are superb bedtime teas. Which is why I found myself drinking the Sweet Meadows Chamomile Lemon Myrtle Herbal Tea from Numi Teas on a Thursday morning at 2am! I wanted to go to sleep, so figured it was time to give this chamomile tea a try. 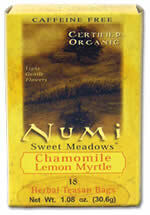 I like lemon teas too, yet another reason I was intrigued by this tea from Numi. And indeed, right after opening the package, I was greeted by the moderate aroma of a 'lemon chamomile tea," which is exactly what this tea is. Here is how Numi Teas describes their chamomile tea on their website : "A sweet and calming infusion of Egyptian chamomile flowers and bright, tangy lemon myrtle, an indigenous herb from the rainforests of Australia. This charming organic teasan infuses pleasant simple flowers with a lively lemon scent. Fall in love again for the first time in Sweet Meadows." This tea, which is organic, contains the following ingredients : Whole Chamomile Flowers and Lemon Myrtle (from Australia). Thus, a pretty short list of ingredients goes into this tea, never a bad thing when dealing with chamomile teas. Fall in love again? Love with a tea? Hmmm...call me crazy...but I think I'll pass on that opportunity. Now, that said, I don't see how you could fall in love with this tea, truthfully. The taste just wasn't so "special" that it will leap out at you and propose marriage or anything. This is not saying the tea is bad. Instead, it just isn't anything special. The lemon flavor in this tea is nice, but when mixed with the chamomile flowers, I found the taste to be a bit on the different side. I like fresh chamomile teas (loose-leaf) without anything added, and I think what happened here is that the lemon somehow contorted the flavor of the chamomile a bit. I think this is what produced the somewhat weak bitter taste I discovered in this tea. Overall, this tea won't be your favorite chamomile tea, at least once you have tried a few flavors. Still, it isn't bad...it's just "different" - and not necessarily in a good way. In particular, I wasn't especially pleased with the "light bitterness" found in this tea...as bitterness in any shape or form is NOT something you want right before bedtime. Recommendation : Yes. It's not the best chamomile tea available, but it is quite flavorful if tasting a bit different. I guess I wasn't entirely wild about the "different taste" produced by the mixing of lemon myrtle with chamomile. It wasn't bad...but wasn't great. Still, if you like lemon or chamomile teas, this tea is definitely worth trying. If this will be your first chamomile tea tasting experience, I would recommend Tazo Calm instead, however. Brewing Instructions : Pour boiling water over tea bag. Let brew for 4-6 minutes. 5 minutes was used for this review.